Now that I've written this movie/television/culture blog for five years, it has come to my attention that I've never done a blogathon before. Truth be told, I'm still a bit muddled into what exactly a 'blogathon' is. The way I understand it, a group of bloggers write on a particularly topic and publish on our own site at a particular time. Recently, through Facebook I came in contact with the site Silent-Ology, which is devoted to silent films. However, they along with another silent film-centered blog, Movies Silently. As I too love silent films, I approached them about participating and they welcomed me. Now, the films covered for this blogathon, those that have something to do with World War I, are not all silent films. They merely have to do with the First World War, which this year marks its centennial. I consider myself fortunate to be invited, and encourage my readers (all 12 of you) to look at the other sites and wish me well as I participate in this endeavor, the first for me. 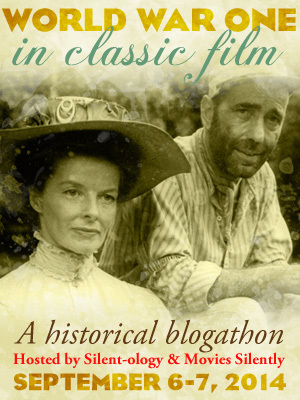 My film is The African Queen, and I'm very excited about both the blogathon and the selected films (including my own). Hopefully I'll do this right and be a credit to the other blogs with which I'm participating with. Finally, as we go through this blogathon, I hope we take time to pause and remember the terrible cost World War I took on those who fought it and those who lived through it, all gone now. If you don't think the aftereffects of the First World War don't matter, think on this. It was after World War I that the European powers broke up the dead Ottoman Empire, creating the current states of Jordan, Syria, and Iraq despite the aspirations of groups like the Kurds, who wanted their own independent state. It was after World War I that the Balfour Declaration, where Britain stated a support for a Jewish state in Palestine, planted the seed for the eventual state of Israel. Ho Chi Minh went to the Versailles Peace Conference, hoping for an independent Vietnam (then called French Indochina) from colonial French control. The collapse of Germany led to chaos and the rise of both Weimar decadence and ultra-nationalist groups like the National Socialists in Germany and the Fascists in Italy. Our world today, with the horrors in Iraq, Syria, and Israel in particular, were basically created by this 'war to end all wars'. Rather, it was the war that began all wars. Still, let us also look towards a great retrospective on films made during and/or about World War I.